DETROIT — Much of the Midwest was preparing for a rapid thaw after this week’s polar vortex sent wind chill temperatures plummeting below minus-50 in some places. But the transition to warmer conditions threatens a new set of problems. 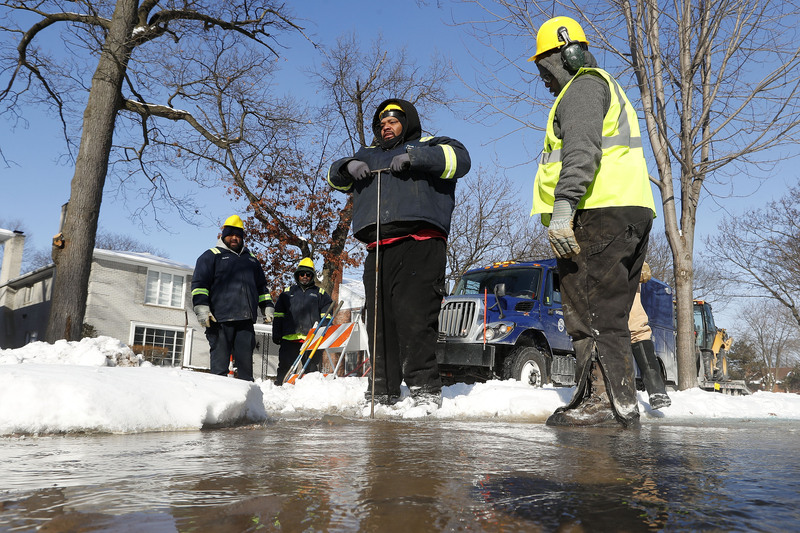 Two dozen busted water mains were being patched Wednesday in Detroit, and that number grew to 44 on Thursday. But with temperatures pushing 50 degrees expected soon, there could be far more. Leaking also is a frequent byproduct of massive temperature swings. Prior to the cold snap, several inches of snow fell across many parts of the Midwest. The sun or warm air up from attics melted some snow on pitched roofs, but the low temperatures caused the runoff to freeze before it was able to leak or drain from gutters. A bridge in the western Michigan community of Newaygo, about 40 miles north of Grand Rapids, was closed because of flooding from a 17-mile-long ice jam on the Muskegon River. Authorities say the river is already above flood stage and warn residents that it could overtop with warmer temperatures and rain forecast for the coming days.